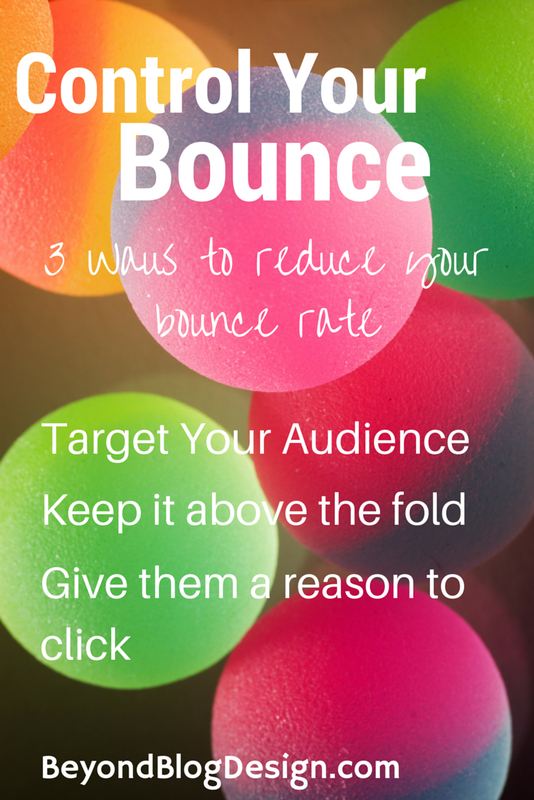 Bounce rate is how many people come to your blog and leave without clicking on anything. Why should you care? Bounce rate is a metric. Metrics are what search engines use to decide if they should send readers your way. A typical blog has a 70-90% bounce rate. To be successful you should shoot for 70%. Remind me why I care? You want your readers to find what they are looking for on your blog. It effects your SEO. Bounce rate is one of the ways Google judges you. If you have a high bounce rate Google decides you don’t know what you’re talking about, and bumps you down the list. If you want to monetize your blog there is a twofold implication. 1) Sponsors use your bounce rate to determine if they want to offer you work. 2) If you run ads, a high bounce rate means less ad revenue EVEN if you have huge page views. This does not mean who do you WANT your target audience to be. It means who are the readers that are organically finding your site. The easy way to figure out who is visiting your site is to use Jetpack or Google Analytics. Using your Jetpack plugin, go to -> Site Stats there you will find valuable information. Search Engine terms. If you are lucky and you have lots of visitors, and Google has granted you their search engine terms (people logged into their Google accounts are accorded the privacy of having their search engine terms hidden) you can see what keywords or terms people typed in that brought them to your blog. Top Posts and Pages. Jetpack lists how many viewers look at each post. That is another way to figure out what people are coming to you for. Look at your most popular posts, you are bound to see a pattern if you look over a few days. Look very carefully at this information. You may have gotten a huge boost in your views and SEO rankings after a post of yours went viral, you may be tempted to start writing more of those posts hoping to capitalize on that traffic. But if you see by your stats that is NOT the most common category overall, you may want to rethink that. If you look at each item carefully, you will see a pattern. Use that information. Put Important Content ABOVE THE FOLD. Make sure when people come to your blog they see something that is inline with why they showed up, or they’ll bounce in under 10 seconds. Above the fold. That is what people see when a blog page loads without having to scroll down. Let’s say you write about music. Most of your posts are about music, and when you look at your stats it seems that most people come to you for music related posts. But you still can’t figure out why you have a 90% bounce rate. Your header is only your name, or an obscure title, with no tagline or images. There is nothing to suggest your posts have anything to do with music at first glance. Only one post is showing above the fold and it is a post you did as part of a blog round-up that has nothing to do with your normal content. You have a picture of your child in your sidebar towards the top. Next is your Facebook Feed which looks more like a personal Facebook feed than a blog feed. So – someone Googled “Cool Music Blog” and they landed on your page. But what they saw did not SCREAM cool music blog at all. It screamed personal blog. And if that person is looking for some cool music, and can’t figure out how to find it in under 15 seconds, he’s gonna bounce. Give Them a Reason To Click! But say instead of my header being just my name, I add a tagline. Maybe…. Hmmm… now right off the bat that says, maybe you’re in the right place! Now if I could give them a reason to click…. How about a menu bar across the top that is specific, easy for them to understand, has categories like “Music Reviews” “Rock n’ Roll”. The definition of bouncing means they landed and they left WITHOUT CLICKING. As soon as they click, even if it is to an outside source it is no longer considered a bounce! A header that is not too high so there is more room for content. Short excerpt posts with a “read more” link at the end. An attractive blog subscription form following the Social Media buttons. A list of most popular posts, recent posts or categories. Look for “Hot Zones” anything that you can possibly make clickable should be clickable. Try to leave the “About Me” for an item on your menu. If you feel you really want an “About Me” widget then leave it for below the fold. Do not use up valuable, clickable space for something that any reader who wants to stick around will find anyway. However if who you are is integral to what your blog is about, maybe a life coach, or a fitness guru, you may want to find a way to get that information as high up as possible, maybe even in the header, so there is still room for the rest. Lowering your bounce rate can only be a good thing. Why are we writing if not for people to read us? If you find you have a bounce rate of 88% with the average visitor staying for under 30 seconds, then you aren’t accomplishing that goal. A blogger doesn’t always have a niche, and sometimes it can be hard to narrow it down. But I believe when you are honest with yourself, at the very least you will see a general pattern. Maybe as general as “Humor” “Depression” “Motherhood.” Give people a way to understand who you are and give them something to click on, right from the start, that can only be a bonus in the realm of Bounce Rates. And remember if you need help with this or anything else, I am always happy to spend some time talking to fellow bloggers, my door is always open. You know what I mean. This is great! I’m working on bounce rate…just redesigned my blog and it made a huge impact. Thanks! Thanks Jennifer! I think it’s important for bloggers to realize bounce rate is caused by different things. For a regular website, maybe selling something or offering a type of advice, the design changes might involve something different, but for a blog it is about capturing the attention of the reader right away! Glad you’re seeing an impact!